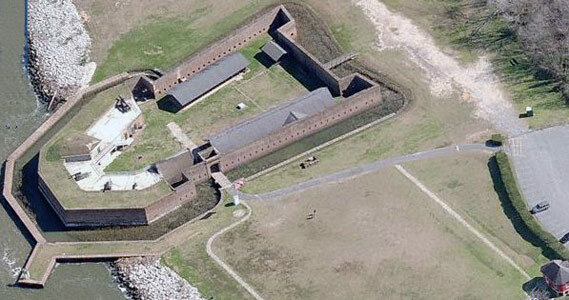 Old Fort Jackson is a popular tourist destination. The fort is well managed by the Coastal Heritage Foundation. Visitors enjoy a film explaining the fort and its history, guides in period uniform, a daily firing of the canon, and a gorgeous view of the river. The fort was authorized in 1808 by President Thomas Jefferson to protect against British attack. It was named after James Jackson (a senator from Georgia) and is the oldest standing fort in Georgia. Prior to the construction of the current fort, the site was an earthen fort, built in 1776, again for defense against English attack on Savannah. Civilians sought defense in the fort during the War of 1812 and the Civil war, but the fort never had to encounter attack from the British navy during the War of 1812 or the Union Navy in the War Between the States. However, on December 17th, General Sherman, in his “march to the sea” demanded the surrender of Savannah and its surrounding forts. Gen. William Hardee commanded the Confederate forces in Savannah. He managed to delay his answer long enough to give the Southern forces time to build temporary bridges and escape to South Carolina by night. Once safely in South Carolina, the two ships that guarded the river, the CSS Savannah and CSS Georgia were sunk. 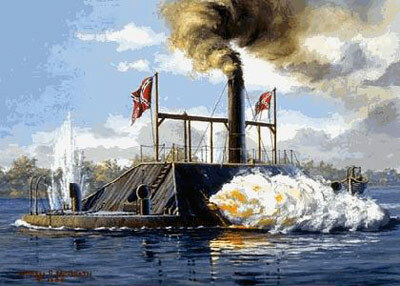 The CSS Savannah was a Richmond-class ironclad steam sloop, commissioned on June 30, 1863 to guard the Savannah River entrance, near Fort Jackson. Parts of the wreck remain on the bottom of the Savannah River, close to buoy 52A, directly across from the fort. As part of the Impact Studies conducted by the Corps of Engineers for the deepening of the harbor project, divers examined the remains of the wreck to assess what would happen when the channel is deepened. While the results of their dives are not yet known, it is doubtful that there is much remaining that is worth salvaging.